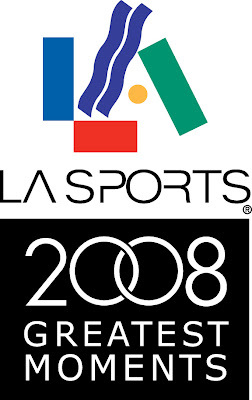 The Los Angeles Sports Council is asking Southern California sports fans to help select “The Greatest Moments in Sports” for 2008 in the Los Angeles/Orange County area. Through balloting at http://www.lasports.org/ fans can cast their vote in 18 different award categories. Voting will take place from December 15 - January 15, and the winners will be revealed at the Sports Council’s fourth annual LA Sports Awards dinner and show from the Beverly Hilton Hotel in Beverly Hills on Friday, January 23, 2009. Last year, Becks' introduction and first game against Chelsea were named the Galaxy's Top Moment of 2007, beating the club's run to the SuperLiga final and the final season of Cobi Jones in a Galaxy uniform. Beckham's introduction was also named the No. 2 moment in all of LA sports in 2007, with only the Anaheim Ducks' Stanley Cup championship resonating more with the local media. For the third straight year the awards gala will air on FSN Prime Ticket (dates and times of broadcast TBA). Appearances by many notable athletes, coaches, broadcasters and team executives are expected. Each specific team or university has nominated its top three “greatest moments” of the year. Fans may vote in any or all of 18 categories, but are not permitted to vote more than once. A “moment” refers to anything from a specific instant in time -- such as a winning goal, hit or shot -- to a special event, individual or team record, or career achievement. Nominated moments must have taken place in the local area, or have involved a local athlete or team. Additionally, a blue-ribbon media panel will select and rank the overall Top 10 moments of the year and also will select the Sportsman, Sportswoman, Sports Executive, Coach, and overall Greatest Moment of the Year. Those winners will be announced on the telecast as well. Previous winners are USC’s 2005 football national championship, Kobe Bryant’s 81-point game in 2006, and the Anaheim Ducks’ 2007 Stanley Cup victory. Past Sportsman and Sportswoman of the Year honorees include Matt Leinart, Lisa Leslie, Elton Brand and Allyson Felix. The “greatest moments” concept dates to 1995, when the Sports Council created a special event celebrating the “100 Greatest Moments in Los Angeles Sports History.” Kirk Gibson’s 1988 World Series home run was voted the No. 1 all-time moment. This year’s event program includes a dinner, followed by the award presentations and video highlights. Winners will receive awards created by Tiffany & Co. The “Greatest Moments” event is a fundraiser for the non-profit Sports Council, which will utilize the proceeds to further its mission of promoting economic development through sports in Southern California. For more information about this event and to vote, please visit http://www.lasports.org/.